Arcanum’s a new webcomic (over at Thrillbent) written by John Rogers, of Leverage (from TV) and Blue Beetle (from comic books, and previously touched on here) fame. Arcanum’s sort of “24,” fighting the sinister and secret return of magic to the world. 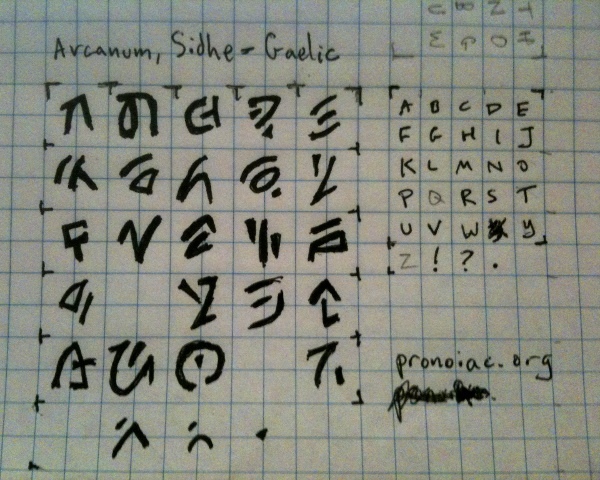 There’s “an alien language” called “Sidhe-Gaelic” therein, which is basically a dingbats font, which can be easily decoded, given enough text. Today’s issue 6 offered enough text to decode, so I took a shot at it. What was encoded? Spoilers follow.